Join us for the USC4P&J documentary films series, Eyes Wide Open. Every Thursday from May 19 to June 16 we'll screen a documentary in English at the Linux Club near the ex Mercati Generali in Ostiense. Screenings are free of charge. Linux Club requires an annual membership card at the more than reasonable cost of 5 Euro / year (valid until December 31, 2005). Donations to help cover costs of DVDs and shipping are greatly appreciated. Films will begin at 8pm with a discussion to follow. Curious about how it went? Read Patrick's account. Or an article by Howard. The film examines how a radical fringe of the Republican Party used the trauma of the 9/11 terror attacks to advance a pre-existing agenda to radically transform American foreign policy while rolling back civil liberties and social programs at home. 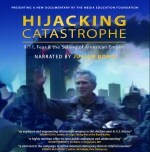 The documentary places the Bush administration’s false justifications for war in Iraq within the larger context of a two-decade struggle by neoconservatives to dramatically increase military spending in the wake of the cold war, and to expand American power globally by means of military force. 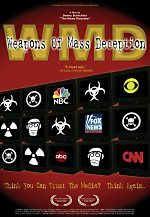 At the same time, the documentary argues that the Bush administration has sold this radical and controversial plan for aggressive American military intervention by deliberately manipulating intelligence, political imagery, and the fears of the American people after 9/11. The fall of 2001 brought us assaults against Americans' comfort zone on many fronts. We learned that we could fall victim to attacks on US soil and we learned that those guarantees provided to us in the Constitution were equally vulnerable. 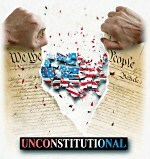 Unconstitutional provides the facts and stories that illuminate administration lies, wrongheaded policies, and the real victims of these actions--the American people. You'll get the real story behind the USA PATRIOT Act and other administration policies and the gut wrenching stories behind those affected--from law-abiding store clerks to United States Olympians unable to travel. It'll remind you of what America used to stand for and what it seems we're falling for now. 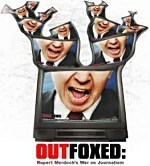 In short, this one-hour film will affirm why you're angry and give you a tool to help others join your ranks. Curious about how it went? Read Judith's account.